It goes without saying that corporate training assists the strength of a business by letting it focus on the main assets of the organization, the employees. Development and training not only equips the employees with the much-needed expertise but it also implies that the company is properly invested in enhancing the future of the employees. If corporate training is incorporated properly, it can play a pivotal role in improving productivity of employees, their quality of work, safety, morale of workforce, profitability, corporate image and retention of employees. This generation is lucky enough that technology comes to rescue the budget of a company or a business. 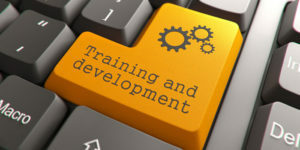 Nowadays there are too many businesses which continue using technology for training. However the solutions that are preferably used aren’t complex or costly; rather they’re free of cost. Let’s take a quick look at the different business tech tools that owners should invest in. When your business has lots of remote workers, there will be a time when you will need to show them how you’re doing some specific task like setting up some spreadsheet report. What should you do in order to show your remote employee? Well, you can share screens. The trainees and teachers will be able to see the same screen on their computers while talking over computer video call or over phone. There are software programs like Join Me, Skype and Screenleap which offer simple and fast ways of sharing screen with remote colleagues. If you have an objective in mind, you might be eager to beef up the skills of your team through different informative courses? Don’t forget that online training is perfect for corporations and businesses since the team members learn new things being seated in their own comfortable settings. The company doesn’t have to incur any travel costs and this makes online training less costly. You can take into account Lynda.com in order to look for online courses as this site is now a part of LinkedIn. You can use the camera of your phone or even your webcam to record some video and show that to others. If you want to show your staffs how they could use a new machine or master the art of some special technique to be used inside your office, you can use such instructional videos. There is another variation which is a screen-capture video for teaching how the staffs could do something. You will need to share your screen-capture through a tool. The only benefit of sharing videos is that the trainees can check out the video a number of times to make sure you understand it in the best way. If you don’t think it’s crucial to share visuals or screen but you wish to explain some new concept, you can go for an audio conference call or even a video conference. Google Hangouts, Join Me, Go To Meeting and Skype are few of the viable solutions for conducting video conference calls. Few companies have started using Zoom as it enables you to live broadcast the session to Facebook Live. Therefore, if you’re wondering about the different ways in which your business can stay updated and connected with its remote employees, you can take into account the above mentioned web tech solutions which are a must-have for all business firms.